The first question I had to ask was “Do I really need another “Pastoral”, albeit it’s my favourite Beethoven symphony and has been for fifty years. My collection stretches back to pre-war Toscanini and the BBC SO, Furtwängler, Karajan, Klemperer, Walter, Wand, Abbado, Böhm, Mackerras and my first, bought on the modest CFP label, André Cluytens and the BPO … and I’ve left out a few. I always feel better after hearing it. I never get tired of it as it can stand a wide variety of styles. The Egmont Overture appropriately starts this disc. This live recording was previously on BBC Legends BBCL 4158-2 coupled with First Symphony, and a vivid Fifth that I’m about to review as another release on LPO-0087. It was favourably received by my colleague John Quinn. Egmont is a powerfully emotional piece about a sixteenth century Dutch nobleman. Beethoven was expressing his concerns over the rise of Napoleon. Whilst the Overture is usually performed on its own there is other incidental music from the play. There is a fine recording of this by George Szell on Decca, with other great performances in a 5 CD Original Masters set. Tennstedt has more than the measure of this highly charged overture and whilst memories of Klemperer and Furtwängler remain, this is a mighty fine performance and I’m glad that the audience applause has been retained. 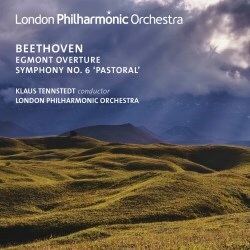 Tennstedt’s Pastoral starts at an ideal tempo. Right from the start I realized this was going to be a great performance. I could relax and listen to Beethoven’s wonderful portrait of the “Awakening of cheerful feelings upon arrival in the countryside”. “Scene by the brook” follows seamlessly unlike Sir Thomas Beecham’s Sony traversal which seems to pinpoint certain aspects without completing the tapestry and I write as a huge fan of the Great Man. Karajan, except with the Philharmonia on Warner never “got” this movement but Tennstedt does and the orchestral playing is sublime. It’s often said that he was best live and whereas I’m not knowledgeable enough to refer to his Mahler, although I like it, here in Beethoven, caught on the wing this is very special. I should also mention the recording which is first rate which is especially creditable given the Festival Hall’s acoustics. “Peasant’s Merrymaking” is just the right tempo unlike dear old Otto Klemperer (Warners) who clearly must have had in mind very old men dancing. As the movement continues the mood darkens and clearly a storm is brewing. The wind section is particularly strong here. I only wish credit had been given to them in the booklet. “The Storm” is strikingly frightening because the previous movement was so cheerful in its first stages. Some critics unfairly thought Toscanini only got going at this stage. I’ve heard a great many storms but this is one of the very best. It must have been thrilling for the audience who despite it being February are very quiet. As the Storm ends the “Shepherd’s Song” comes in with a real feeling of thankfulness. The first time I heard this as a child on the radio I cried with the sheer emotion of the moment. That feeling has never gone away. I was slightly fearful that this epic performance might fall at the last fence but no worries. Orchestra and conductor storm through to a magnificent conclusion. This recording, albeit on the short side, is worth every penny of its modest price. Whether this is your first or thirty-first “Pastoral” this is a truly inspired performance by a much loved conductor and a first rate orchestra. I’m delighted it’s now available.